After seven years of work, scientists have created an "equilibrium gel." Soon, it could be in everything from nanotech to medicinal drugs. It doesn't matter if we're born into high society or into humble circumstances. It doesn't matter if we're good or evil. It doesn't matter what we do, or where we go. At some point in our lives, we will all be unfortunate enough to eat some jell-o. Yes, it's always bad. Yes, even if it's lime. Yes, especially if there are marshmallows suspended in it. What kind of sicko are you? The point is, many of us will have taken part in making the jell-o we eat, and so have seen gel-making in its current, imperfect state. The powder is dissolved in very hot water, then poured into a mold while it is still in liquid form. As the liquid cools, the gel solidifies. This is phase separation, and it is what happens when most gels are made. They start off as liquid, and then tiny network of particles forms as the liquid cools. That network renders the liquid solid, often with parts that won't solidify sloughing off. Phase separation continues to happen in gels after their cooling. Even the best of them eventually turn to glop. The new equilibrium gel is different. It is formed with a material found in many household products: a synthetic clay called Laponite. 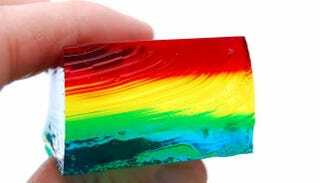 Scientists suspended Laponite in water and, using x-rays, studied how it formed a gel. At concentrations of less than 1 percent, the Laponite mixture broke down after three years. At concentrations above 1 percent, the gel formed a stable structure. The structure didn't separate into sections that had an over concentration of liquids and a stolid section with no give. It stayed at the same consistency, all throughout its structure. It might not seem like a huge discovery, but "equilibrium gel" has enormous practical and theoretical potential. This gel could be used in everything from gel-covered medicines to batteries to nanotechnology. On the theoretical side, many are saying that this gel represents an entirely new ‘state of matter'. Bose-Einstein condensate – move aside.